Moving the blog to my own domain has been on my mind for long time. Finally, after lot of contemplation, I moved from blogspot to its own domain. Yes, Spill the Spices is now www.spillthespices.com. On this occasion, I want to thank my hubby for all the love, support and props!!! Also my friends and readers, for their constant encouragement and great feedback. No milestone in my blog is complete without something sweet. Cheesecakes have been on my to-do list for long time. And I think this is the perfect time to post a cheesecake to celebrate the occasion. This is no-bake cheesecake using agar-agar powder. You can make this cheesecake in a springform pan, but I prefer to serve them in small glasses. This is an easy dessert you can make ahead for get-together's and parties. 1. Grind the biscuits with cocoa powder and brown sugar to a semi-fine powder. Melt the butter and add to the biscuit mixture. Mix well until the mixture becomes moist. 2. Spoon the mixture into the glass and press it firmly and evenly using the back of the spoon. Refrigerate till we prepare the next layer. 1. Beat the cream cheese and sugar on low-medium speed until smooth. Set aside. 2. In a bowl take the cream and whip it until medium peaks. Set aside. 3. In a saucepan add strawberries, water and sugar. Cook on medium heat until the strawberries are soft. Transfer to a blender and puree it. 4. Return the puree to the saucepan and sprinkle the agar-agar powder. Cook on low heat and keep stirring until the powder is completely dissolved. 5. Add this puree to the cream cheese mixture and beat on low speed until well incorporated. Add the whipped cream and fold gently. 6. Pour this mixture immediately into the glasses and refrigerate for 20-30 minutes or until set. 1. In a saucepan add strawberries, water, sugar and vanilla extract. Cook on medium heat until the strawberries are soft. Transfer to a blender and puree it. 2. Return the puree to the saucepan and sprinkle the agar-agar powder. Cook on low heat and keep stirring until the powder is completely dissolved. 3. Spoon this mixture immediately on top of the cream cheese layer. Refrigerate for about 3-4 hours or overnight. 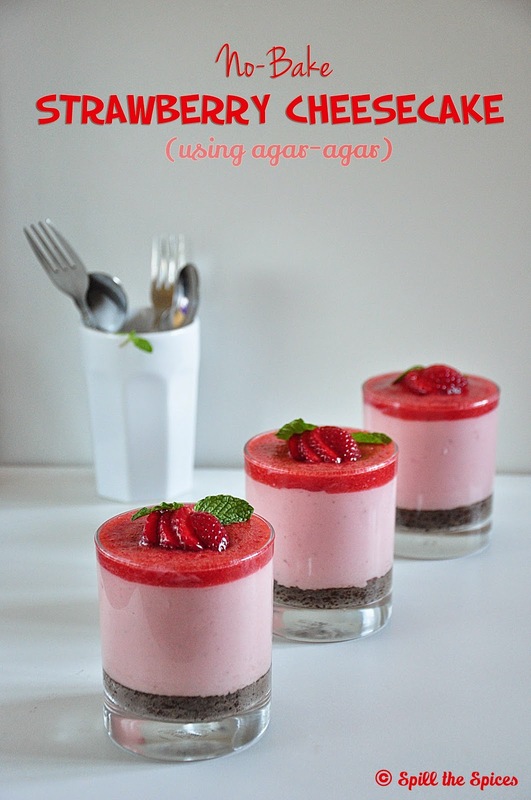 If you are using agar-agar flakes, try with 3 - 3 ½ tbsp for cheesecake layer and 1 - 1 ½ tbsp for strawberry layer. Boil for a little longer time. After adding agar-agar, do not set aside. Immediately pour to the glasses and refrigerate to set. Congratulations on your milestone of moving to a custom domain! congrats and tempting clicks of yummy dessert. looks tempting,nice color dear ! Congrats dear....... 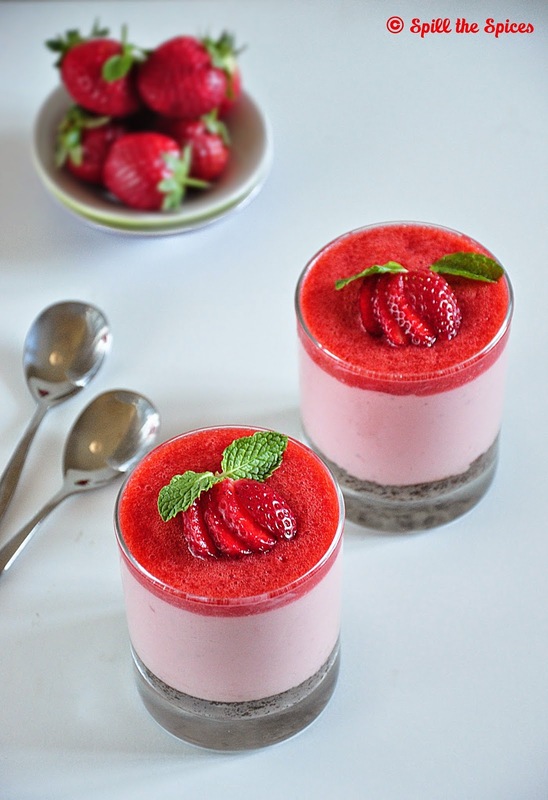 Strawberry cheesecake looks delicious and yum!! Congrats dear ! Cheesecake looks wonderful..
Congrats Sona on moving to ur own domain.Sooo refreshing, very beautiful cheesecake, would love to have a glass. Congrats, wishing many more years of happy blogging. 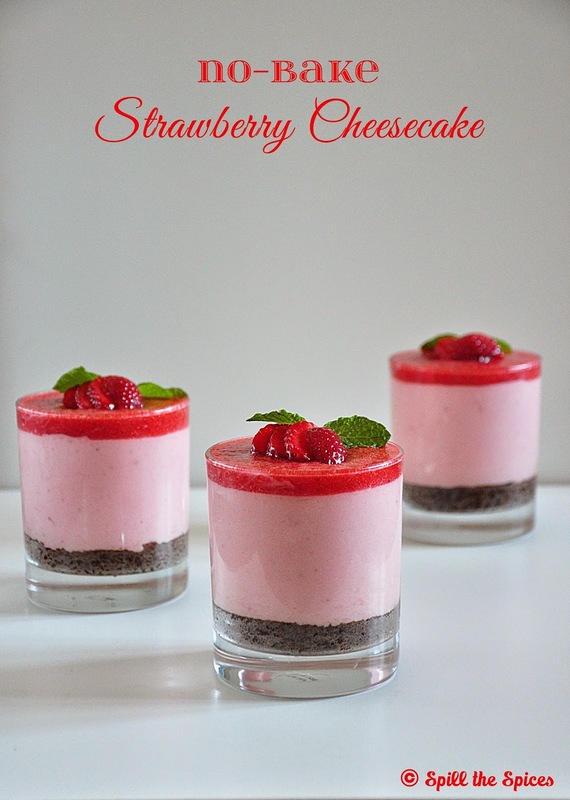 No bake strawberry cheesecake looks really yumm. Awesome Sona. Congrats on moving to your own domain. This strawberry cheesecake looks so inviting. Beautiful shots. See you sometime at my space..
congarts n tis s a perfect treat ..
Congrats dear :) Yummy cheesecake.. Drooling pics and love it ! Awesome clicks!!! Congrats on your new domain and cheesecake looks super delicious!! Congrats!!! Cheesecake looks awesome. Yum yum.. Lovely pics too..
Congrats on your new domain.. Awesome pics,, the cheesecake looks delicious.. perfect layers and colors. Congrats sona.Saw this only now since Iam out of town.Lovely presentation and beautiful clicks.